The MX300 1TB M.2-2280 SSD option is the least expensive per GB M.2 storage option in the 1TB size as of right now. The obvious question is how does the low price point relates to performance. In my experience, this drive is quick and the performance is very solid. I am getting sequential reads of 530 MB/s and writes of 463 MB/s. While it may not be as fast as the top performing Samsung models, I believe it delivers a superior value. Heat is also well controlled. Crucial uses what they call "adaptive thermal protection" technology. Whatever it does, it does it well. It's durability is rated at 220TB written which is pretty good. I would recommend this drive to anyone looking for lots of storage at a good price. Decent speeds, lots of storage. Best bang for your buck if you are looking for a 1TB SSD. The M.2 factor made installing this thing a breeze. Works great! Don’t have much to say other than I’m pleased. It is fast as advertised. A bit hot under load. This little guy is awesome, not only is it silent it also adds no cords to the build and is very quick. Man, M.2 made me squeamish about ever getting 2.5" again, this thing is a beaut. Fits perfectly inside my cram-packed little HTPC. This SSD has some serious speed! The connection is easily 4 times faster than my HDD, and it's large enough to store a lot of games too. Best price m. 2 I could find, fast, took about 10 seconds to install. I can't see much advantage in an nvme as this takes about 15 seconds to boot. 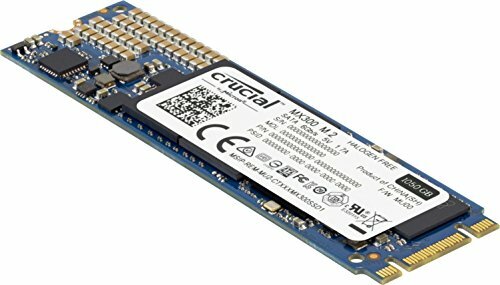 A good, fast M.2 SSD. I did regret this purchase a little, considering the MX500 series must've come out literally a month or two after I bought this. NVMe wouldn't be worth it for me anyway, so no regrets there. When pairing with an M.2 heatsink like the EK one (because blue PCB, yuck), get some airflow over it, otherwise it'll get a little too toasty. Especially when the M.2 slot is covered by your GPU.